Siamese cats are, perhaps, best known for their sleek, distinctive appearance. Although many Siamese cats are a silver-gray color with blue eyes, these pretty kitties' coats can also be orange, brown, cream, and even blue or lilac-colored, among other coat variations. But there's much, much more to Siamese cats than their mysteriously good looks! For example, did you know that Siamese cats are one of the oldest breeds of domesticated cats in the world? Or that their coat coloring is determined by their genetics and the temperature of their surroundings? Yes, really! If you want to learn more—and want to check out some seriously cute photos of Siamese cats—read on! As we said, Siamese cats' coats can be an incredible range of colors—and those colors aren't only determined by genetics. Grab your lab coat and get ready for a little bit of biology. The color of a cat's coat is determined by several sets of genes and the patterns of their coats are determined by modifier genes. Genetics 101, right? Well, Siamese cats have a special modifier gene that inhibits pigment from developing in the fur, resulting in albinism. But, thanks to the magic of science, the modifier gene for albinism can only affect the cat's fur above a certain temperature—or between 100 and 102.5 degrees, to be more precise. Once a Siamese cat's body drops below approximately 100 degrees—or the cat is in a colder environment—her genes for coat color turn back on and carry pigment to her fur. Because a cat's body is cooler around her nose, ears, paws, and tail, that's where pigment is most commonly deposited on Siamese cats. Most Siamese cats are born completely white and develop their markings in the weeks following birth. Why? Because the womb is very warm and blocks the cat's color gene from reaching her fur. 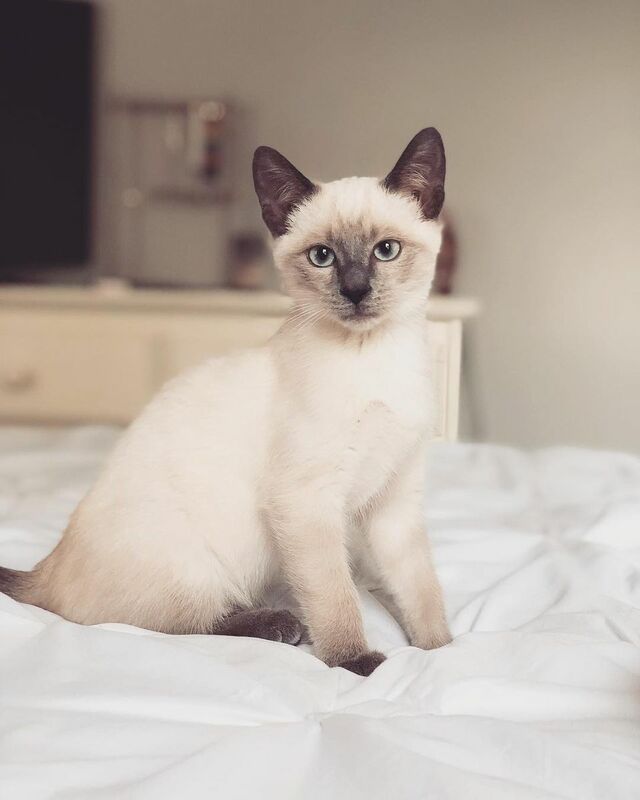 Following birth and being exposed to the cooler atmosphere for a few weeks, Siamese kittens will start to develop pigment around their faces, tails, and paws. Although no one is certain when Siamese cats were first bred and domesticated, it's commonly believed that they originated in Thailand around the 14th century, when they first appeared in a Thai manuscript. This would make them one of the oldest cat breeds in the entire world. For a long time, many Siamese cats had crossed eyes and crooked, kinked tails. Although these traits were undoubtedly the result of certain genetic factors, many legends offered alternate explanations for Siamese cats' interesting appearances. There are still Siamese cats with crossed eyes and crooked tails today, but it's not nearly as common. These traits were determined "undesirable" by cat fanciers and selectively bred out. We say the cats are just performing their security guard duties! Hundreds of years ago, Siamese cats were treasured by royal families in Thailand because of their distinctive, unusual, and beautiful appearances. In fact, members of these royal families believed that a Siamese cat would receive their soul when they died—and the cat would spend the rest of his life living in a temple and being pampered by monks and priests. Not a bad gig, huh? Although Siamese cats have been domesticated in Asia for centuries, they didn't appear in the United States until the late 1800s. One of the earliest known owners of a Siamese cat was actually U.S. President Rutherford B. Haye's wife, Lucy—which means Siamese cats have a history in the White House, too. Her Siamese cat, named Siam, was a gift from a U.S. diplomat serving in Thailand. Oldies, but goodies, like The Incredible Journey, The Lady and the Tramp, and That Darn Cat! starred Siamese cats. In fact, the entire plot of That Darn Cat! is centered on a Siamese named DC (or Darn Cat) who helps stop a kidnapping. And while DC from That Darn Cat! helped prevent a fictional kidnapping, two real-life Siamese cats helped foil espionage back in the 1960s. When two Siamese kitties living at the Dutch embassy in Moscow, Russia began scratching at a wall, their owner suspected they were reacting to a noise that couldn't be detected by the human ear. And he was right—30 small microphones were discovered behind the wall. If you have a Siamese cat (or have spent time around one), you know they're extremely talkative. Siamese cats will vocalize their opinions on their food, observations they make through the window, and basically anything that they encounter throughout the day (and night).